After twelve mostly busy days at Melissa's parents, we hastily packed up her Civic and hit the road for phase two of our travels. We're going to be driving across the USA for the next two to three months, visiting friends, family, and major attractions in our home country and crossing off a lot of states from our personal check lists. Some of this, especially in the Southwest between the Grand Canyon and Tallahassee is subject to change depending natural disasters and how we want the trip to go, but that's the basic plan. We're excited to see a lot of our own country, including major landmarks like Mount Rushmore (new to Melissa) and the Grand Canyon (new to Adam), as well as checking out the cities we're heavily considering as our new homes after this trip is over. Along the way, we're going to try to "cross off" states to get each of our lists of states visited closer to all 50. Before the start of this trip, we stood at Adam: 31, Melissa: 24 states "visited," but of course what counts as a visit is a constant debate for us. There's some gray area, but for me, stopping and getting a meal in the state fully counts, but only driving through or having a layover there doesn't count. We personally don't count it if we only get gas, but Melissa is going to count Indiana on this trip because we spent about an hour trying to find the "state pie" and went out of our way on a pit stop to a farmer's market in search of one (no luck). On that note, we're going to try to eat something iconic from each state and city, using this list as our guide but definitely not limited to that. If anyone knows of some classic, must try foods from an area on our list, definitely let us know! Finally, despite evidence to the contrary we fully intend to finish up the Central American portion of this blog and start the USA segment, although possibly with less in-depth cultural analysis. To be honest, one of the biggest blockers to that right now is that I was able to acquire a Nintendo Switch and am logging a lot of time in the new Zelda game that's at least a 200 hour experience, but we'll get back on the blog and hopefully catch up now that we have lots of hours in the car and much better internet speeds to finish it up. Thanks to all of our readers so far, and special thanks to Melissa's parents for having us for our recuperation before this leg and all of their generosity, to Melissa's old friends Susan and Conrad for welcoming us to their beautiful house in Chicago, and to everyone on the way that we end up staying with. For now, we're about to head into one of the Chicago restaurants that's been on my personal "to visit" list for the longest, Topolobampo. It's nice to be back in a big city again and although Melissa has spent some time here as an adult, I haven't really so I feel like i'm back traveling again, exploring new areas. It's an incredible food city and our hosts are possibly into fine dining more than we are, so we're going to enjoy our stay here and are excited to start seeing more family and more of America after this. P.S. - Special thanks to our friend and reader Debbie for giving us a huge bags of Northeast chips for the road to supplement our chips posts! We got into the Cheese Doodles camping overnight in PA already! We landed in Newark last night, to Melissa's dad's extreme surprise. That's our fault, Melissa's really, as she conspired with her Mom to surprise him with our return. I feel a little bad for John, getting tricked so badly by his family, but he agrees that this is a memory he'll have for the rest of his life. Several people have wanted to know: "Why so soon?" No, nothing happened like a pregnancy, family issue or other big event, we were simply done with Central America and had as much long term travel abroad as we'd wanted for that trip. The goal was always 3-6 months and we got about a week past three months. This was triple my previous longest trip and a bit more for Melissa. We'd started discussing an alternative to our "plan" in San Cristobal, when we'd been gone for over a month and a half and the constant travel started to wear on us for a bit. Melissa was ready to hang up the backpacks and go back for good but didn't want to sell the trip short. Both of us went back and forth between wanting to push through and see many more countries, and head back sooner than planned to the comforts of America. Backpack travel is hard, I think doubly so in your mid-thirties. So in San Cristobal after one particularly hard day we discussed the possibility of splitting the portion abroad into two phases and returning earlier for our cross-country USA road trip earlier. The pros for this were substantially better weather in the USA (September and October rather than November & December), our friends and family will have more free time to see us without the intensity of the holiday season, and we potentially get two shorter trips abroad rather than one long endurance journey. The cons were that there is a substantial chance that we either won't want to go to South America after our roadtrip, or won't be able to afford it. Also it's a bit more expensive to fly back and forth and extra time but that's a smaller consideration since we usually find good prices or travel on points. In the end, we took the risk of not making it back out in order to get home, see family, finally be able to speak English, pay with credit cards, get a good shower and night's sleep and just be comfortable and relaxed for a while. I know I have been terrible at updating the blog and it may be too late at this point, but I'm going to finish it! For those who weren't on Instagram, we left Mexico for about 10 days in Guatemala and 10 days in Nicaragua, and flew out of Managua on Wednesday morning for an easy, uneventful flight home. I've rarely seen Melissa so excited as she was on the Newark tarmac as we taxied to the gate. We're both glad to be home and around something familiar again. We have discussed at length our favorite things on the trip, the things we missed the most back home, the first foods we wanted to get a taste of again and activities to do in the states. I'm going to document those for posterity, before we forget how different Central America was! In the meantime, thanks to everyone who has supported us on the trip by following the blog and Instagram, asking about our travels, and especially to Melissa's parents for hosting us and all their endless generosity. We've just arrived at our hostel in León, Nicaragua, flying early this morning from Guatemala City. We spent 10 days in Guatemala, split between the volcano prep and recovery in Antigua, and some more down time and exploring the colorful town of San Pedro on the renowned Lake Atitlan. We're planning to move quickly through Nicaragua and see most of the attractions, starting with volcano boarding today outside of León, visiting the Pacific for the first time on this trip in San Juan del Sur, and the volcanic island lake at Ometepe. What we've read and heard about Nicaragua is that it's poorer but less violent and dangerous than Guatemala (drug trade there). So far it reminds me most of Jamaica and has been hard to pin down. Our taxi ride from the airport to bus station was expensive ($22) but the 2 hour bus to Leon was very cheap ($6). The roads to León were some of the best we've had on the trip, but getting from the "bus station" here to our hostel was one of the most intense and unpleasant short hauls we've had. Fortunately our hostel is nice and we're off to sled down the volcano today so tomorrow will be totally free to explore the city as much as we dare. Articles online say that it's great and safe but we haven't seen that part yet. Our next steps after Nicaragua are totally up in the air, with the timing of the seasons playing a big role in where we want to be. I will catch up on the many detailed posts remaining to write from Mexico and Guatemala, but didn't want to get too far behind for long. 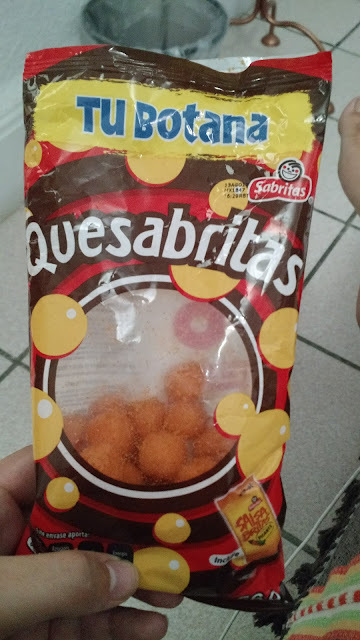 This one may be extra clever: I'm not sure if its a play on "que sabrita" which would mean like "how flavorful! ", or "quesa brita", which sounds like it involves cheese and brightness. Perhaps the Quesabrita marketing team is really good and they both work; my Spanish isn't strong enough to say. Sadly, we had these so long ago that I barely remember. Melissa says they were amazing, like Planters Cheese Balls (are those still around?). They were just what they looked like, cheesy little puffs like a cheese ball. It's hard to go wrong.